Grassroots football clubs in the north of England can access a new £750,000 emergency fund to fix pitches and facilities flooded by Storm Desmond. The Emergency Football Relief Fund has been set up by the Football Association, Premier League and Sport England to help grassroots and Step 1-7 clubs affected by the storm, which battered much of the UK earlier this month. Matches and training sessions across the north of England have been postponed since the storm, with many pitches, changing rooms and spectator facilities now unsafe for use as a result of the strong winds and heavy rainfall. Carlisle United's flooded Brunton Park ground provided one of the iconic images from the fateful storm, which saw unprecedented levels of rain fall across the north west. The emergency fund aims to help grassroots football clubs to have suffered a similar fate to rebuild and repair pitches and facilities, enabling football to continue across the affected regions as quickly as possible. FA Chief Executive Martin Glenn said: “Once the scale of the impact of the recent storms became clear, The FA and its funding partners came together to make funds available to support stricken clubs. Earlier this week, Sport England announced a £200,000 Emergency Flood Relief Fund for clubs, local authorities and other community sports organisations affected by Storm Desmond. The new football relief fund, co-ordinated by the Football Foundation, is available to grassroots clubs affiliated to one of the six County FAs in the affected regions: Cumberland, Durham, Lancashire, Northumberland, Westmorland and West Riding. 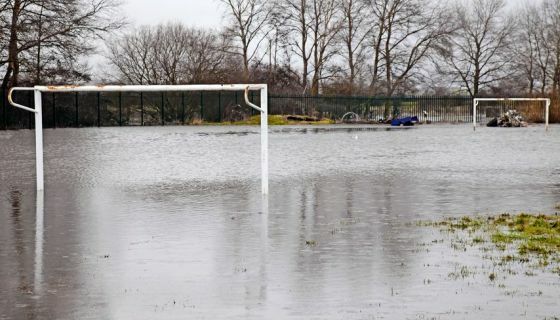 Clubs who have been affected by Storm Desmond should contact their local County FA. Contact details are available on the TheFA.com.